Wow...It's surreal to say the third Brunch and Sew is here. When I developed the concept of Brunch and Sew, it was simple. I wanted to create a platform for women to come together learn to sew, socialize and leave fullfilled. I can proudly say I have accomplished a goal and working to make Brunch and Sew greater. During Brunch and Sew, we have a marvelous good time. It feels like the modern day sewing social club. Yet, it's chic, stylish and oh so 2014. LOL. The experience is amazing. I teach every participant how to sew something that they can cherish forever and actually use. It's my goal to get all beginners comfortable and sewing. I want them to leave with a finished project and ambitious about perfecting their new craft. Thus far... mission accomplished. So our next Brunch and Sew is close to my heart. It's a celebratory event, my birthday and the holiday edition. The December Brunch and Sew I will donate a portion of the proceeds to The Exchange Club of Memphis. I feel like we should at any moment especially during holidays give back. REGISTRATION IS AVAILABLE NOW!! Guess what?! I am offering a discount for all of my readers. When you register for your work space, enter BRUNCHANDSEW at checkout to receive $20 OFF. I'm only offering this fee for the next two days in honor of Black Friday. 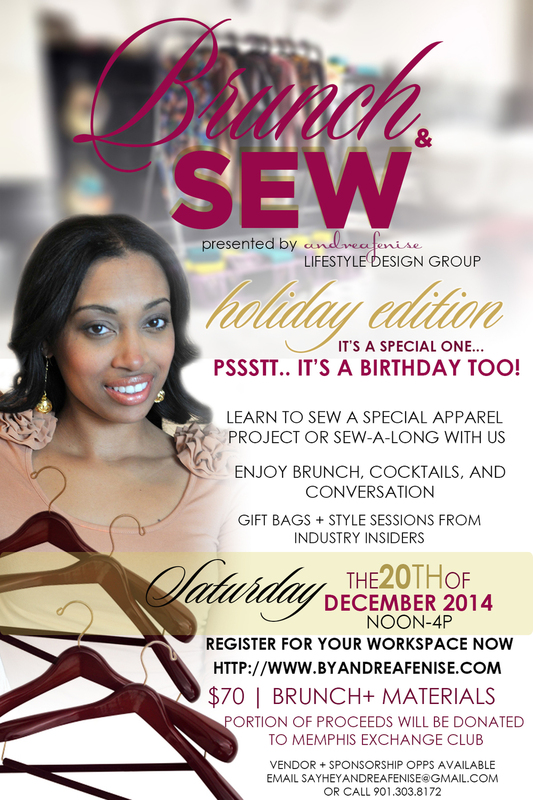 Come out and learn to sew or sew a long with myself and Kamesha Hervey Richard of Ava Loren Design. We will enjoy brunch provided by the amazing Chef Ragan Ogelsby of Ladyfingers Catering. It wouldn't be a holiday celebration if you didn't receive gifts right?! All registrants will receive gift bags from our sponsors. YOUR WORK SPACE IS WAITING FOR YOU!! !